We’ve had our first glimpse of a third-party Radeon VII graphics card, with the appearance of a product page for ASRock’s Phantom Gaming X putting paid to previous speculation that third-party GPUs wouldn’t be available at launch. The Radeon VII goes on sale on February 7, which is just around the corner now, but ASRock has seemingly jumped the gun by putting the GPU on its website, as noticed by Techspot. According to the product details provided, the Phantom Gaming X Radeon VII 16G will run with a base clock speed of 1,400MHz and boost to 1,750MHz, a touch slower than the previous speeds AMD has mentioned on both counts – 50MHz less to be precise. As we already knew, the 7nm GPU comes with 16GB of HBM2 memory, and ASRock’s offering will have three fans to keep the card cool, as well as benefiting from a metal backplate to make for a more robust board. As for its dimensions, the Phantom Gaming X will be 280mm long, 125mm wide, 40mm thick. The advertising spiel on the product page qualifies that the Radeon VII boasts “66% more memory bandwidth than other the competitive gaming GPUs in its class”, namely 1024GB/s compared to Nvidia’s GeForce RTX 2080 Ti which offers 616GB/s of memory bandwidth. 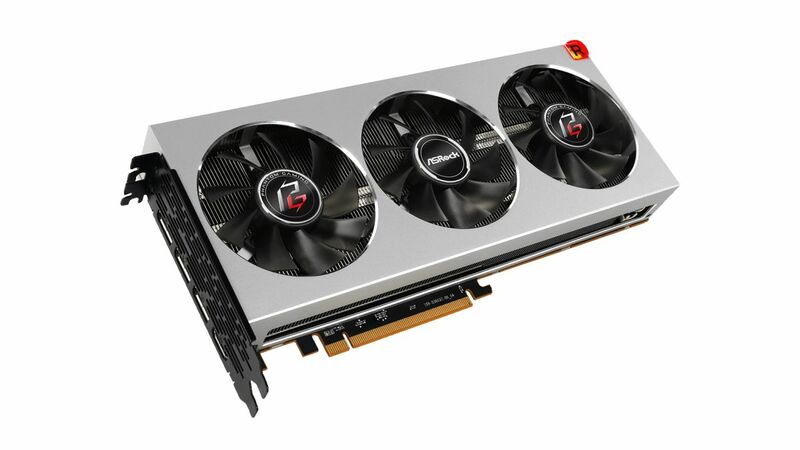 Really, though, this card is pitched against the RTX 2080, and the hope is that it can outdo that particular Turing GPU, while undercutting on the price front, to the tune of $699 (about £530, AU$980) compared to $799 (£749, AU$1,199) for the 2080. That could give Nvidia serious pause for thought when you consider that the company has admitted itself that its latest RTX graphics cards haven’t sold well because the sheer price tag is putting folks off. One potential fly in the ointment for AMD is previous chatter suggesting that stock will prove thin on the ground for the Radeon VII, which would indeed be bad news if the card is in demand, and prices end up being inflated as a result. However, AMD recently assured gamers that there will be enough GPUs to meet demand. It’s also worth noting that when this rumor came to light, it also prompted speculation about there being no third-party Radeon VII GPUs at launch, and the latter has clearly been proved untrue. Hopefully the stock speculation will prove just as unsubstantiated. Next PostNext Cryptocurrency on WhatsApp?